USD: threats to the divergence trade? – Risk aversion can still challenge the Fed’s outlook. Solid US retail sales needed next week to limit any risk aversion-driven USD underperformance against JPY, EUR and CHF. GBP: enough pounding? – Improving UK data and the largely unchanged BoE outlook could offset Brexit fears to a degree and support GBP. AUD: remain cautious – AUD latest underperformance could continue next week in view of Australian and Chinese data releases. NOK & SEK: ahead of CPI – CPI data out of Sweden and Norway may matter less in the face of low oil prices and Riksbank’s FX intervention threat. XAU: Gold shines – Gold has been the best performing asset in our universe since the start of 2016 as risk aversion burnished its safe haven appeal. 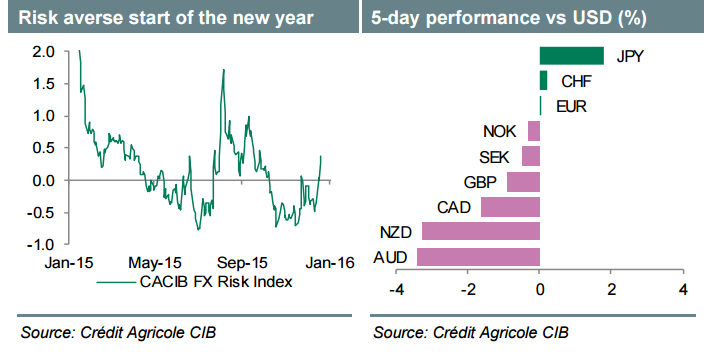 Markets began 2016 in a sour mood, and this resulted in a “risk off” sentiment”. US Crude Oil Inventories, Australian Employment data, UK rate decision, US Retail sales, Producer prices and Consumer sentiment stand out. These are the highlights of this week. The U.S. Non-Farm Payrolls report showed a remarkable job creation of 292,000 during December closing out 2015 with a bang. The only disappointment was in wages, which actually fell slightly, but if job growth continues, wage gain should accelerate according to analysts. This did little to cheer investors, as worries about China, crashing oil prices and various geopolitical fears all triggered worries. This benefits the euro and the yen against the dollar while hurting all the rest. US Crude Oil Inventories: Wednesday, 15:30. The weekly petroleum report showed U.S. commercial crude inventories contracted by 5.1 million barrels, maintaining a total U.S. commercial crude inventory of 482.3 million barrels. Economists estimated an increase of 700,000 barrels in crude inventories. Total gasoline inventories leaped by 10.6 million barrels last week, moving into the upper half of the five-year average range. WTI tumbled to lows seen in 2004, and this reflects worries not only about high supply, but also low demand. Australia Employment data: Thursday, 0:30. Australia’s unemployment rate declined to 5.8% in November, amid a whopping job gain of 71,400 positions. The unemployment rate reached a 20 month low. The reading was contrary to analysts’ expectations predicting a loss of 10,000 jobs. The participation rate rose to 65.3% from 65% in October. Full-time employment increased by 41,600, and the number of part-time jobs rose by 29,700. The employment figures showed the strongest two-month period of jobs growth since December 1987 and January 1988. Australian economy is expected to shed 10,300 jobs in December while the unemployment rate is expected to rise to 5.9%. UK Rate decision: Thursday, 12:00. The Bank of England maintained interest rates at 0.5% amid expectations that inflation will remain subdued after another sharp drop in the oil price and a levelling off in wage growth. Policymakers estimated domestic demand has remained unchanged in November. The central bank noted the UK policy depends only on the inflation outlook and will not be influenced by other central banks actions. US Unemployment Claims: Thursday, 13:30. The number of Americans filing initial claims for unemployment benefits declined to 277,000 from more than a five-month high of 287,000. The reading suggests the labor market remains firm despite signs of weakness in economic growth during the fourth quarter. Analysts expected claims to reach 274,000. The four-week moving average of claims dropped 1,250 to 275,750 last week. The four-week moving average of the so-called continuing claims fell 4,000 to 2.22 million. The number of jobless claims is expected to reach 278,000 this week. US Retail sales: Friday, 13:30. Retail sales increased 0.2% in November after rising 0.1% in the previous month. The reading was in line with market forecast. However, automobile sales were weak falling 0.4% following a 0.3% decline in the prior month. Excluding vehicles, core sales rose a very solid 0.4% beating forecast for a 0.3% rise. Consumer spending, which accounts for more than two-thirds of U.S. economic activity, slowed in September and October. The weakness came despite a tightening labor market, which has started to lift household income. US PPI: Friday, 13:30. U.S. producer prices edged up 0.3% in November, despite the moderate inflation trend. The reading followed a 0.4% decline in October. Economists forecasted a flat reading. Excluding food and energy categories, core prices increased 0.3% while analysts expected a 0.2% gain. Overall producer prices were down 1.1% in November from a year earlier, the 10th straight year-over-year decline. Core prices were up 0.5% from last year. US UoM Consumer Sentiment: Friday, 15:00. The University of Michigan’s final reading of December’s consumer sentiment came in at 92.6, higher than a first reading of 91.8 reaching its highest level since July this year. Consumers were more optimistic over their current conditions due to lower inflation, which increased real incomes, however, consumers were less confident about their future situation. Meanwhile, inflation expectations for the next year decreased slightly.